Eric Foner’s The Fiery Trial begins with hard words from Lincoln on December 1, 1862. Lincoln admonishes his administration and Congress they’ll be remembered for their honor and dishonor. The Civil War is the fiery trial and future generations the jury. Lincoln’s assassination forces a change in presidents but his leadership put the nation on an irrevocable course, despite the efforts of Andrew Johnson. Stephen King’s latest novel, 11/22/63, hits the rewind button in a fictional attempt to escape the history since John Kennedy’s assassination on11/22/63. On Chris Matthews’s Hardball, King sees many similarities between Kennedy and Obama, and the “nut country” as they called it in 1963 and the “nut country” of today. Fellow citizens,we can’t escape this nut country. I’ve grown up in the nut country, read history of the nut country, celebrate the nut country on July 4th and gold medal stands. My heroes have been nuts. My friends have been nuts. The opposition has been nuts. The secret to the success of the United States is simple- big nuts. The nuts keep the country from tearing apart. I don’t mean the Oswalds. Mark Twain was called the “Lincoln of literature” for his humor and adventure. Mark Twain was nuts. He had to be to write with Huck’s voice in his head. But that crazy voice in his head was also in the head of America in the Reconstruction era. Other countries have revenge in their head. What kind of nutty country would have a newly created Secret Service the first day on the job get the big boss whacked by a second rate actor? A country that reads Mark Twain, not Karl Marx. After the war, nutty Americans created the Marshall Plan to make nuts out of the German character. Stephen King wants to rewind history in his novel, depriving us of the meaningful lessons that came from the upheaval. Here is where King, and the historians he consulted, miss the mark. Out of pain can come great things. The fiery trials of the Civil War, World Wars, Vietnam, the Great Depression, oil shocks and stagflation, have always led to “Nuts!” and innovation. Progress is impossible without pain. Here’s an example on a smaller scale of the nut country effect. In the fall of 1963, two months before the Kennedy assassination, a young baseball pitcher named Denny McLain made his big league debut. He was a young rebel, like the student protesters of the Vietnam era. The only rule he followed was the strike zone. Most other rules didn’t apply. He was a musician, playing on the Ed Sullivan show. He and his Detroit Tigers teammates witnessed the terrible 1967 race riots in Detroit. His manager, Mayo Smith, was said to be a hard drinker but the pitchers back then were trained to go nine innings. Mayo had time to sober before putting on his thinking cap. Mayo Smith rode his pitching staff to his own fame, even getting a Mayo Smith Society created in Washington that for awhile was whispered in the same breath with the Council of Foreign Relations and Skull and Bones. Well, almost. McLain won 31 games in 1968 and the Detroit Tigers won the World Series. Then the baseball version of the Tet Offensive and Watergate hit Denny McLain. He was accused of being involved with the mob and running a bookmaking operation. Chased out of baseball, McLain filed bankruptcy twice, got more involved in organized crime, made $160,000 for smuggling a fugitive out of the country, went to jail, got out of jail, played music at a Detroit bar as the washed up heavyweight champion Leon Spinks served drinks (“Weird drinks. Different colors and what not”) from behind the bar (described as Art Deco, “kind of Miami Vice”), invested in a meat packing company, looted the company of its pension plan, returned to jail, and got out of jail. I’m not done. Neither is Denny McLain. I got turned around in construction a couple of months ago near Port Huron and almost entered Canada. Denny McLain did the same thing, at about the same time. But he had an arrest warrant from Louisiana in yet another business deal gone bad. Surprise? McLain even got caught selling bogus telephone cards with his partner, John Gotti Jr. Yes, that Gotti. McLain beat the rap on the Louisiana scrap metal deal. He’s currently a free man, and in search of more deals to be scored. 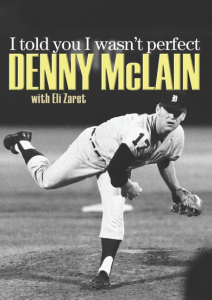 In 1969 as McLain’s baseball career prepped for destruction another Detroiter, Elmore Leonard, turned to writing crime novels rather than westerns. From Mark Twain to Elmore Leonard, one man’s pain can be a nation’s gain.